THERE HAS BEEN just one prosecution in relation to the unauthorised use of a drone since restrictions were introduced two years ago. Thousands of these devices from across the country have been officially registered and it is estimated that the numbers of non-commercial drones may be significantly higher. In December 2015, the Small Unmanned Aircraft (Drones) and Rockets Order was introduced, governing the use of any small unmanned aircraft in Ireland. 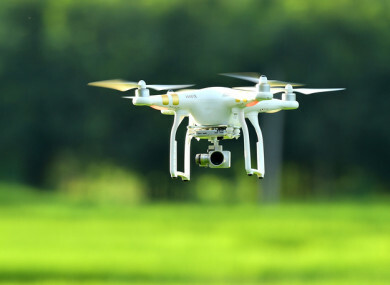 It required all drones weighing over 1kg to be registered with the Irish Aviation Authority. To date, some 8,376 drones and model aircraft have been registered. However, drones below 1kg can be flown without a permit, provided they remain no more than 15 metres above ground level and no more than 300 metres from the operator. The most popular non-commercial drones are under this weight and it is estimated that there are hundreds of these across the country. He said early on, most users were professional photographers or videographers who were using the drone as an additional tool for their work. However, now many amateur photographers are investing in them. Their commercial use has become more widespread in Ireland too, and O’Briain said there are some surveying companies that have fulltime drone pilots working for them. “If we look at this from a risk perspective, there are risks that these aircraft can remove. In jobs where you might have someone climbing up ladders, putting themselves at risk, you can send an unmanned aircraft up, it’s relatively small and quiet and it can do those high-risk jobs,” he said. There are many applications for government bodies and emergency services too. Dublin Fire Brigade has begun using a fleet of drones at major incidents to allow them to find trapped people, hidden dangerous chemicals and areas of buildings weakened by fires. The drones also allow them to get a sense of how a fire is spreading. Earlier this year South Dublin County Council said it would begin using drones to tackle dumping in the Clondalkin area. The council told TheJournal.ie that it is progressing with its proposals and drones will be used in the county from early 2018. The Police Service of Northern Ireland (PSNI) has successfully used drones to prevent the harassment and maltreatment of a native falcon, the peregrine. The birds were being poisoned, shot, trapped and having their eggs and chicks stolen from nests. Cameras fitted on drones that patrolled the area were used to monitor hotspots for this activity and there was a clear reduction in incidents. There are dangers and concerns associated with these devices, however, and that is why the restrictions are in place. Farther than 300 metres from the controller. In a negligent or reckless manner so as to endanger life or property of others. “When people think of drones they think of privacy and spying. With the cameras on them, if it’s able to identify you with that [low] quality of camera then you’ll be able to see it,” O’Briain said. With privacy law, if say a drone was to fly up to someone’s window unknown, in that case the person inside has a reasonable expectation to privacy. You are supposed to keep them 30 metres from a building or person without permission anyway.Similar to road traffic laws, they may be robust, but people will still break them. There have been a small number of examples internationally of near misses between manned and unmanned aircraft, including commercial planes. In these cases, the drones were either flying too high or too close to an airport. “You don’t have to go too far to find footage or pictures online that are without any other information and when you look at them you say that was taken illegally. It was taken too high or too close to people or in congested areas,” he said. If a person does wish to fly a drone outside of prescribed limits, they can apply for permission from the IAA. O’Briain said anyone who does this should indicate they have done so when they upload their images or footage online. The media, he said, has a part to play in this too by ensuring that any footage used or shared on news platforms was filmed legally. Approximately 130 drone operators have been licenced with special permission to operate drones. There are six registered training centres providing qualified examinations for those seeking specific operating permission and pilot competency certificates. There are 170 pilot competency cert holders. The IAA said penalties for the illegal operation of these devices “are entirely a matter for judiciary following prosecution”. “Any unauthorised use may be referred to An Garda Síochána for investigation. To date, since the introduction of the regulation, there has been one successful prosecution,” it said. We strongly encourage people to take a drone user course, in order to help ensure that they operate their drone in a safe manner and in compliance with the regulations. For more information on the safe use of drones, please see here. Email “Just one prosecution over illegal drone use since regulations introduced”. Feedback on “Just one prosecution over illegal drone use since regulations introduced”.